A ruby and diamond dress ring. 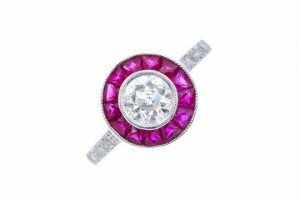 Designed as an old-cut diamond, within a calibre-cut ruby surround, to the plain band. Principal diamond estimated weight 0.55ct. 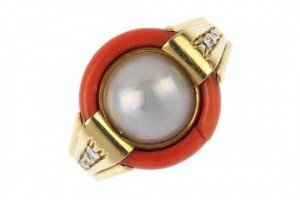 A mabe pearl, coral and diamond dress ring. The mabe pearl, within a coral surround, to the brilliant-cut diamond tapered sides and plain band. Estimated total diamond weight 0.10ct. 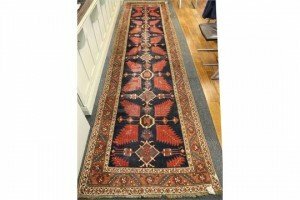 A good antique Caucasian runner, with crucifix designs in red on midnight blue field, within running and frieze border. 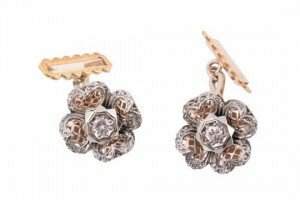 A pair of diamond flower head cufflinks , the pierced two colour flower heads with a central brilliant cut diamond, with bar connectors to a shaped two colour panel terminal. 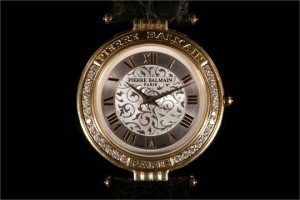 A gents 18ct gold Pierre Balmain, Paris, super slim dress watch, with diamond set bezel, silvered and engraved dial with gilt Roman chapter and original black leather strap. 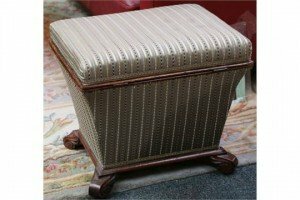 A 19th Century mahogany and upholstered ottoman of sarcophagus form, the hinged lid enclosing storage space, raised on four scrolling feet. A pair of aquamarine and diamond ear pendants. 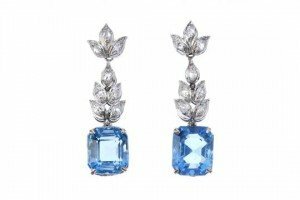 Each designed as a rectangular-shape aquamarine, suspended from a rose-cut diamond foliate line. 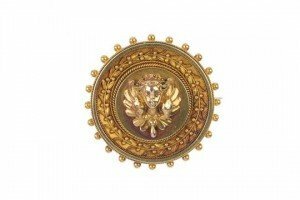 A late 19th century gold target brooch. Depicting a figure with wings, within a foliate, bead and rope-twist border. 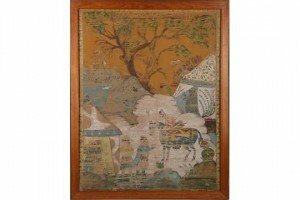 A Persian painting of a figure on a horse, with other figures in a rocky landscape among tents, framed and glazed. 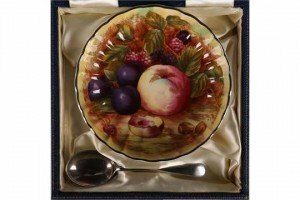 A 1960s blue leather boxed Aynsley bone china circular dish, painted with summer fruits, signed Jones, together with a matching hallmarked silver spoon. 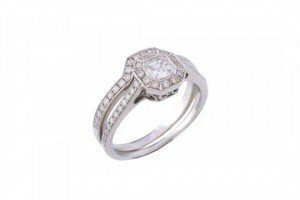 A diamond cluster ring, the central ascher cut diamond stated to weigh 0.39 carats, within a surround of brilliant cut diamonds, to brilliant cut diamond set shoulders. An early 20th century gold split pearl and turquoise photograph pendant. 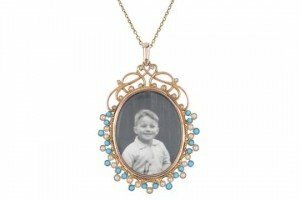 The oval-shape photograph frame, within a turquoise and split pearl scrolling border, suspended from a belcher-link chain. 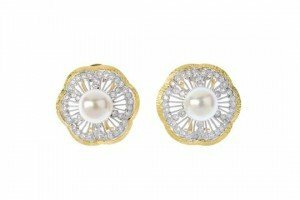 A pair of cultured pearl and diamond floral ear clips. 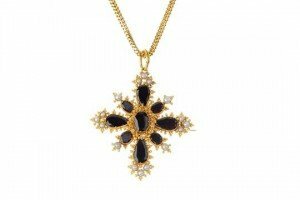 Each designed as a cultured pearl, measuring 8mms, within an openwork brilliant-cut diamond border. Estimated total diamond weight 0.70ct. 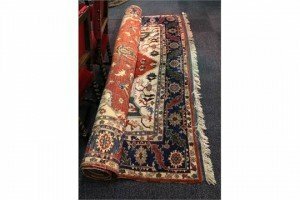 A fine Turkish rug of carpet proportions, with stylised ‘Kaufic’ design on brick red field within many borders. 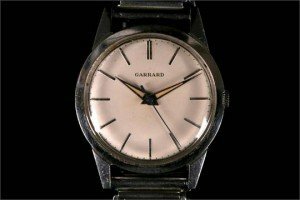 A gents vintage stainless steel cased Garrard dress watch, with baton dial, manual movement and later Bonklip bracelet. 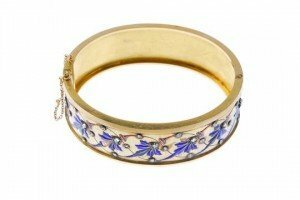 A late 19th century gold enamel and diamond hinged bangle. The blue, white and red enamel scrolling acanthus leaf frieze with rose-cut diamond collet highlights, to the plain half-bangle and raised sides. 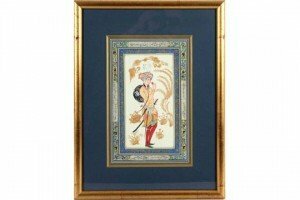 A late 19th Century Qajar miniature of man with fruit, double decorated border incorporating calligraphy after a Safavid original. 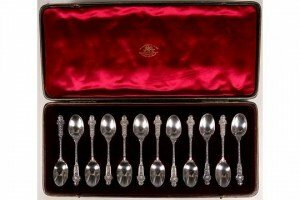 A fine cased set of twelve early Edwardian hallmarked silver spoons, embossed with scrolling Rococo cartouche and mask handles. 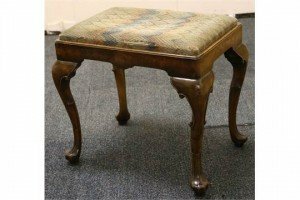 A walnut Queen Anne Revival stool, with needlework drop-in seat, raised on scrolling cabriole legs on carved pad foot. A garnet and seed pearl demi-parure. The necklace designed as an oval and pear-shape garnet cluster with seed pearl accents, suspended from a snake-link chain.